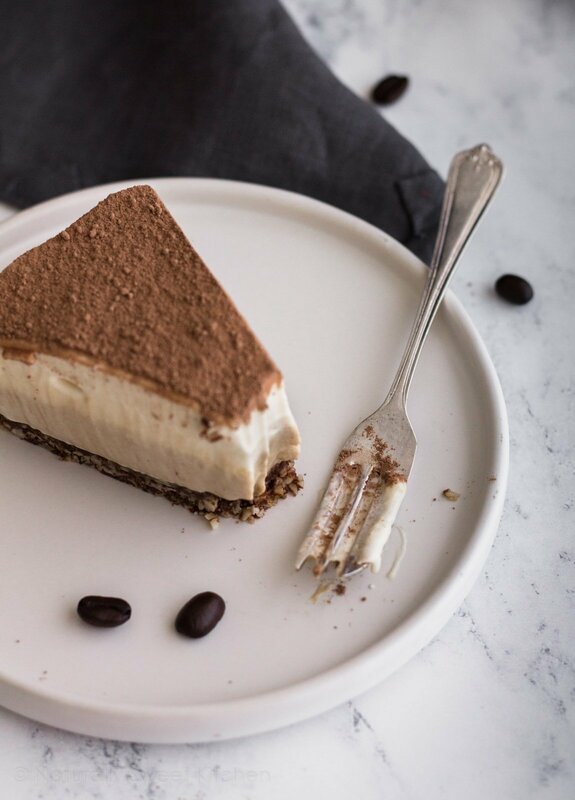 This no-bake espresso cheesecake with a raw chocolate almond crust is divinely light and simple. 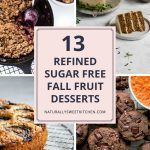 Naturally sweetened with maple syrup and dates, it will be the no-bake dessert you turn to time and time again. The tradition of homemade birthday cake is something my mom has always taken quite seriously. Except for a couple of years my brother or I wanted a cake beyond my mom’s baking capabilities, she always made us exactly what we asked for. It was usually the same one, too: a Duncan Hines chocolate and vanilla marble cake with Betty Crocker chocolate frosting, topped with coloured sprinkles. We were so obsessed with it that by the time we were in our late teens, she didn’t even need to ask what kind of cake we wanted. It was always there on the counter at the end of the day, and it was always delicious and made with love. The last few years I was living at home, I took up the mantle of birthday cake baker. It’s a task I look forward to for a solid month; I love dreaming up a wonderful cake that will make their day special. Thankfully, I know my family well enough to guess what sort of cake they would enjoy. My brother loves any chocolate peanut butter combo and my dad is a black forest fiend. The only cake my mother ever wants for her birthday is cheesecake. Raspberry cheesecake, strawberry cheesecake, really any sort as long as it has “cheesecake” in the title. She’s absolutely addicted to the stuff. And who could blame her? 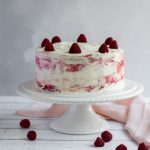 It’s creamy, tangy, pairs with any flavour, and is perfect for a summer birthday. There’s no way to lose here. 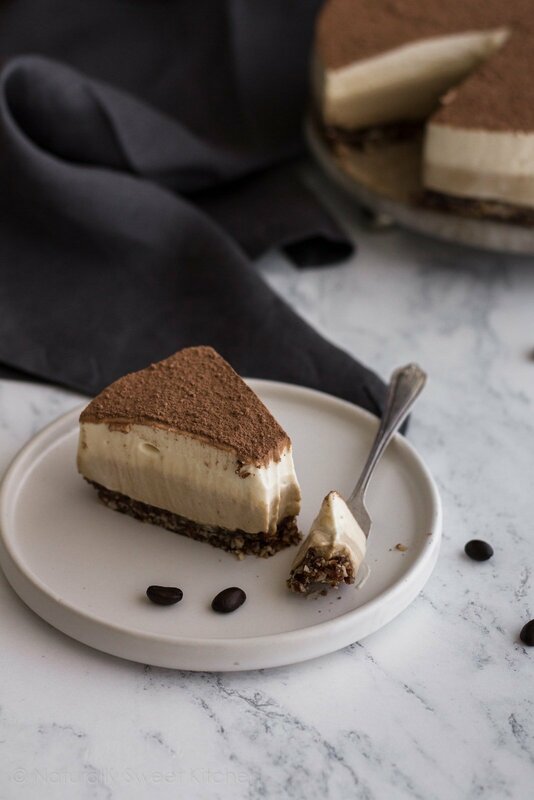 Today is my mom’s birthday, so to celebrate I’m sharing the recipe for this to-die-for no-bake espresso cheesecake. 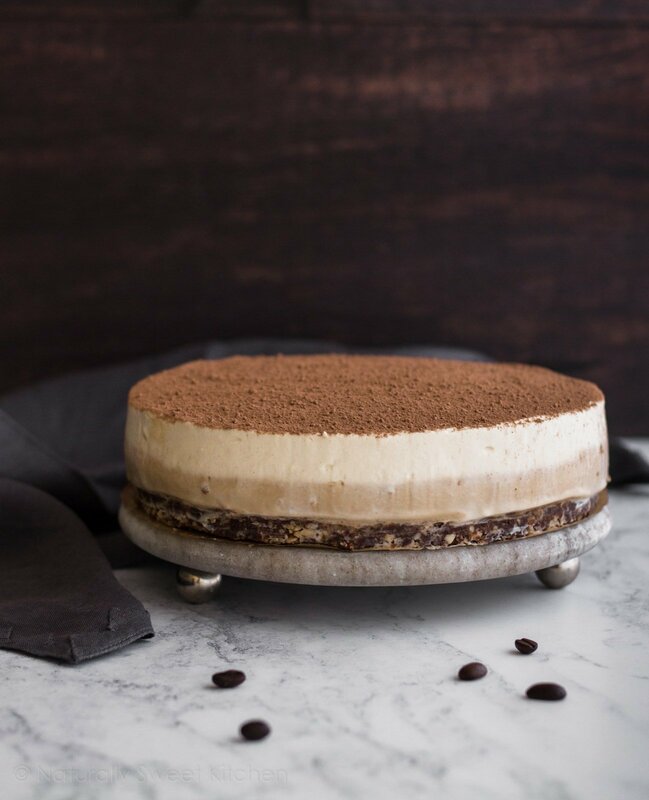 I may have channelled our shared love for tiramisu when creating this espresso cheesecake as it could certainly pass for one. 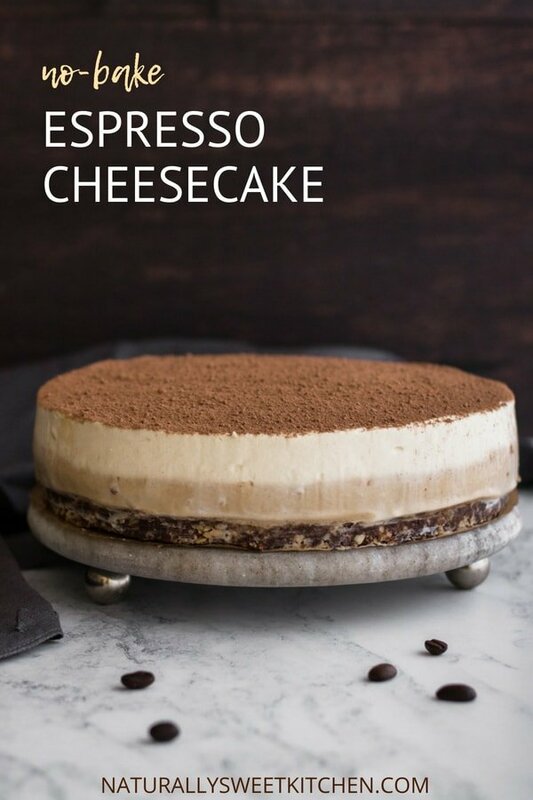 It has all the delicious creaminess you expect from a cheesecake with a mega-hit of espresso flavour from the bottom layer. The chocolate almond crust is definitely one of my favourite parts of this cheesecake. 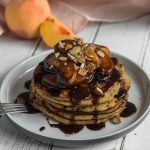 The raw almonds add much-needed texture to the cake, while the dates naturally sweeten and add a slight chewy element. I can see myself using this crust for other desserts in the future, perhaps with different nuts as well! A light dusting of cacao powder on top cuts the sweetness and rounds out the dessert beautifully. 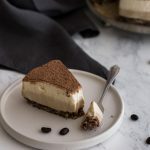 My colleagues are massive fans of this cheesecake; in fact, it was lauded as the “best thing I’ve made thus far.” Do with that information what you will, but personally, I’d take it as a strong indication that you should make this dessert. Tonight, this weekend, whenever. Just make sure you get it in your gob soon! 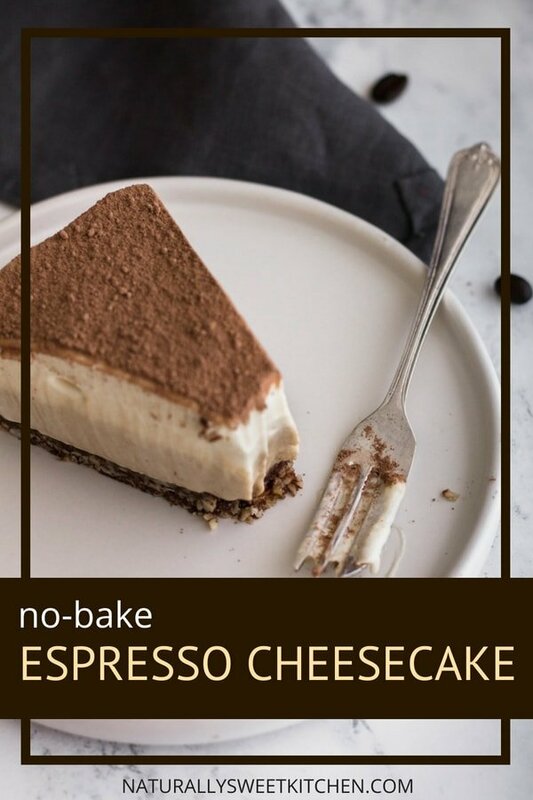 Tonight, I raise a forkful of no-bake espresso cheesecake to my mom and hope she has the most spectacular of birthdays. Lightly grease an 8-inch springform cake pan and set aside. Tip the almonds into a food processor and whizz them around until they form a semi-fine meal. 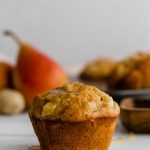 You still want a bit of crunch, so don’t blitz them into powder. Add the butter, dates, sea salt, and cacao powder to the food processor and blitz until fully combined. Empty the contents into the prepared pan and very firmly press the mixture down to form the crust. Freeze the crust for at least 20 minutes while you prepare the filling. Fit a stand mixer with the whisk attachment or grab your electric whisk and beat the double cream on medium speed until it reaches stiff peaks. Set aside. In a clean bowl, beat together the cream cheese and maple syrup until smooth. Gently fold in the reserved whipped cream, taking care not to knock all of the air out. Whisking on a medium speed, very slowly pour in the liquified gelatine. Stop mixing once you have added all the gelatine. Divide the mixture into two separate bowls – there should be about 500 grams of batter in each. To the first bowl, add the espresso powder and fold in gently. Add the vanilla extract to the second bowl and fold in gently. Remove your crust from the freezer and scrape in the espresso batter, making sure to level the top. Place the pan back in the freezer for 30-45 minutes to firm up slightly. Once the espresso layer has hardened, pour in the vanilla batter and level the top. Chill in the refrigerator for at least 8 hours, or overnight for best results. Dust the top of the cheesecake with cacao powder right before serving and serve immediately. The cheesecake will keep refrigerated, sealed in an airtight container, for up to 3 days. Thank you so much honey, this looks like an absolute stupendous creation! I hope we get to share a piece together very soon. I miss you and love you so much! Glad you liked it! 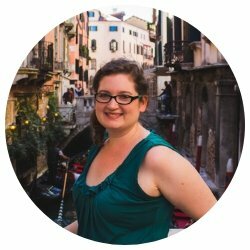 Seriously, it’s super easy if you want to give it a go! Happy birthday! It does look a little like Tiramisu…looks delicious! Oh definitely. Tastes very similar too! Thank you, Rasha!